Angry Birds fans who like a bit of SiFi are in luck with the special Angry Birds Star Wars game. And now when you are not playing games you can still enjoy Angry Birds Star Wars with this poster. 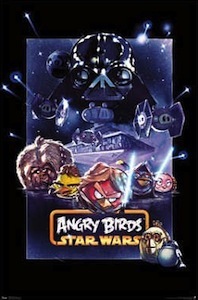 On this dark poster you see all kind of Angry Birds that transformed in to Star Wars look a likes. From a Darth Vader Pig to a Han Solo Bird they are all there. Come check out this fun Angry Birds Star Wars Poster.